Surrounded by a handful of rustic cabanas, the ubiquitous roosters scratching at the dirt, and a few scrawny, wide-eyed puppies, I look down the cliff toward the Antares 44 catamaran anchored in the bay. On our drive from the airport, I had assumed we could use the VHF radio from the Port Resolution Yacht Club. The yacht club, as it turned out, was at best an open-concept shack and the probability of a radio was just as I suspected; zero. “Two Fish. Two Fish,” I call out toward the harbor. I'm here to join Jason and Gail Shell as crew aboard their Antares s/v Two Fish on the final leg of their journey to Australia. There is no movement aboard. 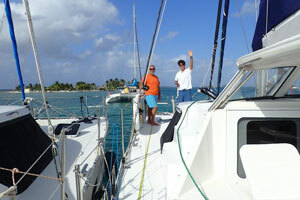 Jason and Gail had just sailed from Fiji to the island of Tanna in Vanuatu and were most likely sound asleep. 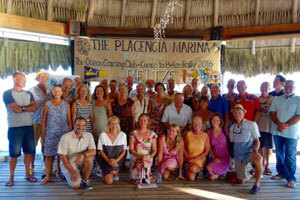 They had joined the World ARC, a global cruising club that organizes sailing rallies. They had already sailed the nearly 12,500 miles it took them to get from St. Lucia to Australia on their initial delivery trip from the Antares factory in Argentia to their home port in New York. So what was it like for seasoned sailors to take part in a large rally? “My uninformed opinion was that rally sailors were cheating by making the challenge easier. I nicknamed the inter coastal water rally “the swarm” and spent our Southern transit avoiding this group, “ explains Jason. “I was wrong,” he adds about his initial bias against rallies. But unlike Jason and Gail, a good portion of the participants in the World ARC were in the early days of their cruising learning curve and for them, the security of being a part of a group was a big factor in joining. The thirty boats in the rally were comprised of a large European presence, a half dozen North American boats, and boats heading home to New Zealand and Malaysia. 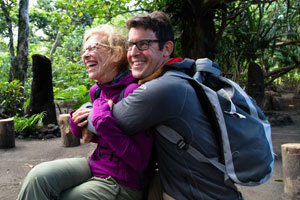 The ages varied greatly from a five-year-old participant to a few nearly octogenarians. “It was easy to find our crowd. In a judgmental way, we coined the term ‘boat marriage’ when two boats would become inseparably attached. We stayed boat single but formed very strong relationships. We were members of the Antares Club as there were a record three Antares in our rally! At one point, we crossed paths with the Ocean Cruising Club rally, which briefly brought our number to five,” says Jason. 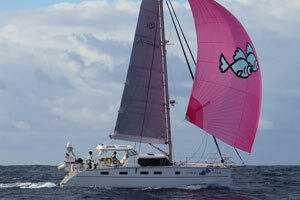 One of those boats participating in the OCC Rally was Antares s/v Echo. “We heard of the OCC from another cruiser when we arrived in Grenada, says Mary Pernick, who along with her husband Jeff, joined the rally in Curaçao. An OCC membership is required to join. Participants must have at least one passage of more than 1000 miles under their hull. Although Mary and Jeff had traveled many miles, they had yet to achieve that milestone based on a rhumb line calculation but were able to join as Associate Members. “The OCC had the route, locations, and formalities such as clearing in and out, welcome parties, resources, etc. It was well organized yet allowed a great deal of flexibility. Some members caught up with the group in Columbia and others said good-bye as they went through the Panama Canal. 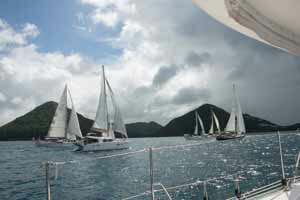 Some chose marinas while others anchored. There was a radio net daily and we formed smaller groups for travel in questionable areas,” says Mary. 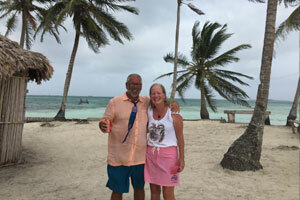 Amongst the OCC rally stops were Aruba, Colombia and Panama’s remote islands where they briefly met up with Jason and Gail. The Pernicks have since qualified for full OCC membership after joining yet another rally, the Salty Dawg. “The resources provided by Salty Dawg were great along with the camaraderie of all involved. We achieved our qualifying passage for full membership, had a great time, and met many new sailing friends as a result,” says Mary. An obvious advantage to joining a rally is the route planning. That’s where collective knowledge and experience becomes invaluable. The rally also simplifies the paperwork and facilitates group activities. 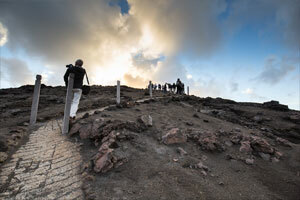 In Vanuatu, it was an excursion to Mount Yasur, one of the most accessible active volcanoes. 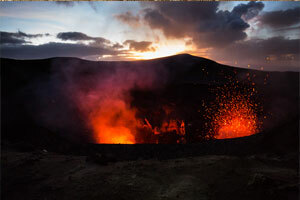 Vanuatu is positioned on the notoriously named ‘ring of fire’, a horseshoe shaped belt that lassoes around the Pacific Ocean from New Zealand to South America – a geographical hot bed for earthquakes and volcanic eruptions. This brings us little comfort as we stand at the edge of the caldera. There is a slight suction then a muffled silence before lava and rocks are unleashed into the sky like a fire-breathing dragon exhaling. It is presumed that Captain James Cook was drawn to the glowing light of Mount Yasur while on his second expedition aboard the HMS Resolution to circumnavigate the globe. It is easy to see why he would be drawn to it and it isn’t until the guide herds us off the volcano that we reluctantly leave this incredibly mesmerizing spectacle. 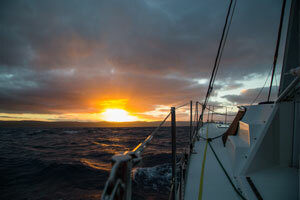 The following day we have a favorable weather window and set off on our passage to Brisbane. Jason and Gail bid their cruising friends goodbye as we weigh anchor and motor past the protected bay to the sound of horns blasting and farewells from fellow cruisers. It’s obvious that with this adventure, life-long friendships have formed. We get another peek at Mount Yasur just as the sun begins to set. The ash-laden hill stands in stark contrast next to the lush mountains; sulfurous steam wafts above the volcano, melding into the nearby clouds obscuring our view one final time. Both the Ocean Cruising Club and Salty Dawg are non-commercial organizations. 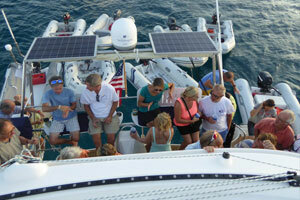 They are organized by cruisers and allow participants both independent and group travel. The World ARC is a part of the World Cruising Club and is pricier but does cover many of the associated fees such as traversing the Panama Canal and permits to the Galapagos.